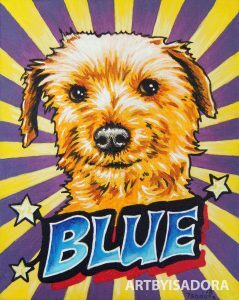 Art by Isadora will offer custom pop art pet portrait paintings on canvas! These portraits will be painted from photos of your pet and will be bold, colorful and super fun! The first sample is above, and there will be several more samples soon before I offer these live in my shop. 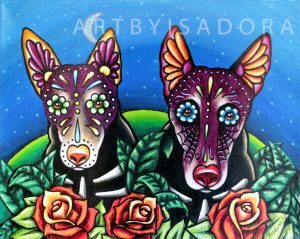 Stay tuned, and as always, visit artbyisadora.etsy.com to see the wide variety of custom pet portraits I offer, all painted from photos of your pet. 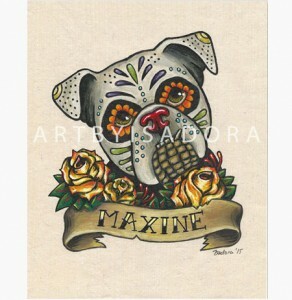 You can order a custom portrait of your dog hand-painted on canvas or rice paper in Day of the Dead portrait style for under $100! 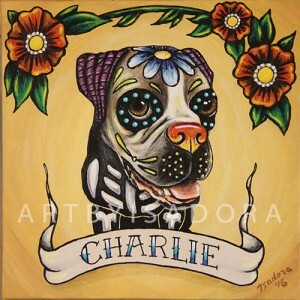 Please check out my Pet Portraits page to look at your style options, or click on the links below to go directly to the ordering pages for each of my day of the dead Pet Portrait styles.